The Alke small crane truck is ideal for moving heavy materials on board the machine quickly using a single vehicle. 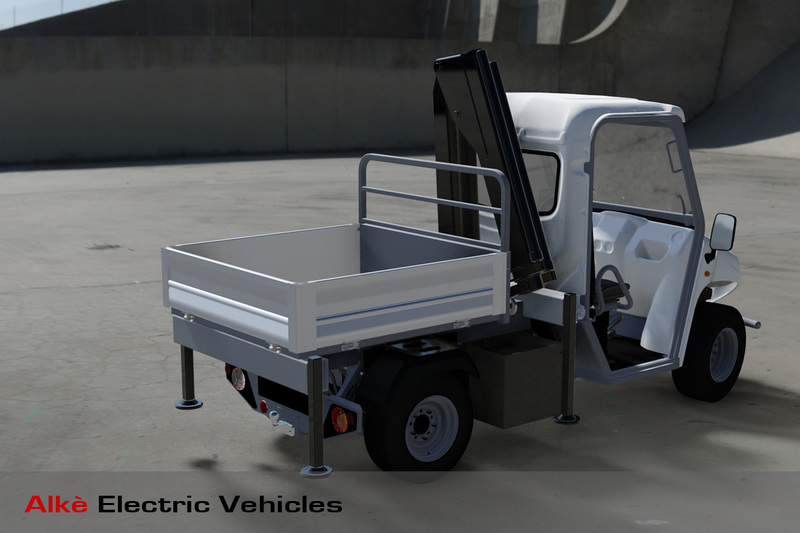 These electric vehicles are fitted with a cargo bed and crane behind the cab that allow you to work quietly and without polluting. The Alke' electric crane trucks allow you to load and transport heavy material safely and quickly using a single vehicle instead of two (forklift and transport vehicle). Moreover, since they are electric, the operations are carried out quietly and without polluting. the boom of the crane fits behind the cab leaving the cargo area free for transporting goods, with a load capacity of 650 kg, while the crane has a lifting capacity up to 1.320 kg up to 1.2 metres. To ensure the stable and safe lifting of the materials with the crane, the small crane truck has 4 stabiliser feet to prevent the load being handled from moving dangerously. The ATX battery powered truck fitted with a crane can also be useful when it is necessary to place heavy material in a high position. It is mainly used in industrial premises for moving heavy components, in construction sites and in general where it is difficult to work with lift trucks. This is an extremely compact crane truck, which is small and easy to manoeuvre and at the same time very stable and solid. The Alkè crane truck is available also in the explosion proof ATEX version for use in potentially dangerous environments like in the chemical and petrochemical industries, natural gas and petroleum production sites, the mining industry, and companies constructing and maintaining tunnels. 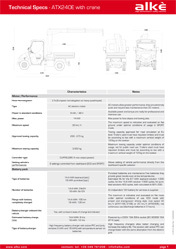 Alkè has lengthy experience in the production of battery powered trucks, for both road/commercial use, as well as more intensive industrial use, all the solutions offered are, therefore, the fruit of years of experience in the electric work vehicles sector.